While staying with another artist friend, I spent half of a day touring the National Museum of the US Air Force. Being that I spent six years in the USAF, and that it was free, it was hard to pass up. 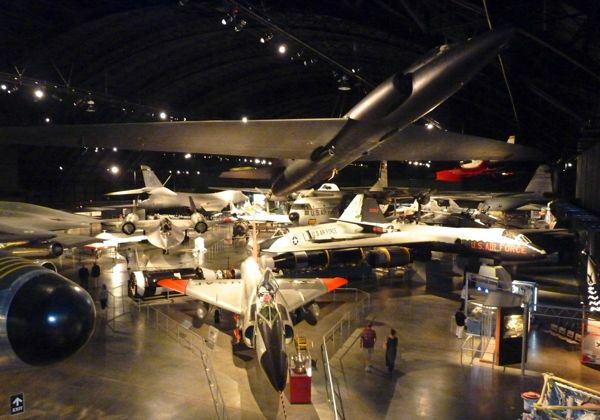 On display were just about every military aircraft, missile and equipment; from the Wright brothers to space travel. Exhibits were in sections by era, and around major conflicts. There were also displays of uniforms, Medal of Honor recipients, supplies, other operations like the Berlin Airlift, the Cold War era, movies, etc. There was so much that it was difficult to photograph anything individually. 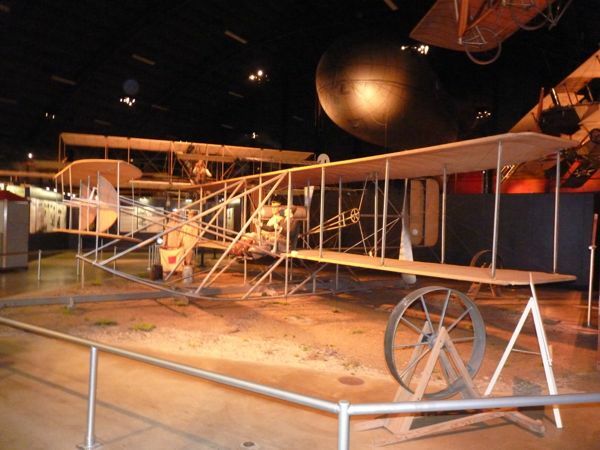 A replica of the Wright Military Flyer from 1909 was the version on display. Most of the craft in the Early Years section were not familiar to me. But, included bi-planes, blimps, and military gear used through World War I. 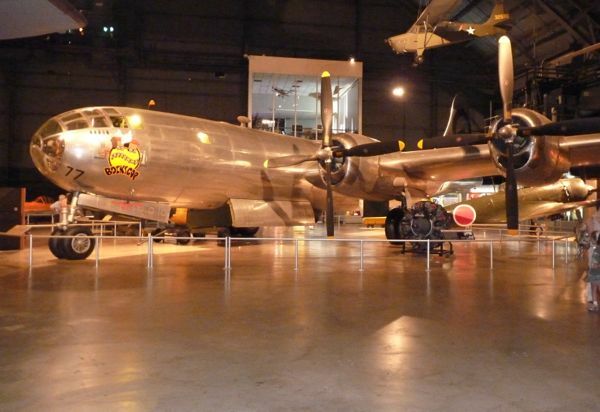 The B-29 Superfortress bomber shown was nicknamed Boxcar, and was the actual craft used to drop the atomic bomb on Nagasaki Japan that ended World War II. 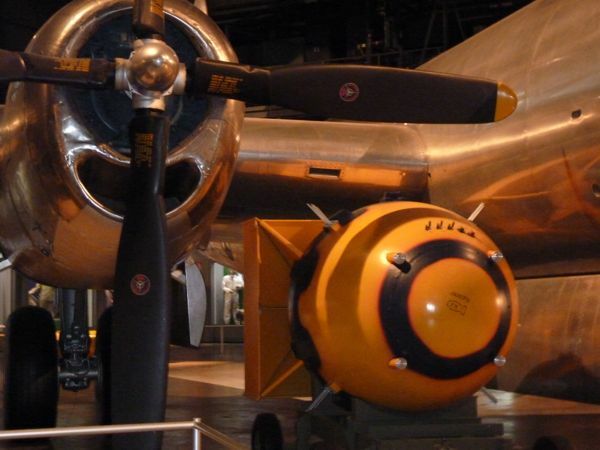 The striped yellow ball is a replica of the A-Bomb that was used. 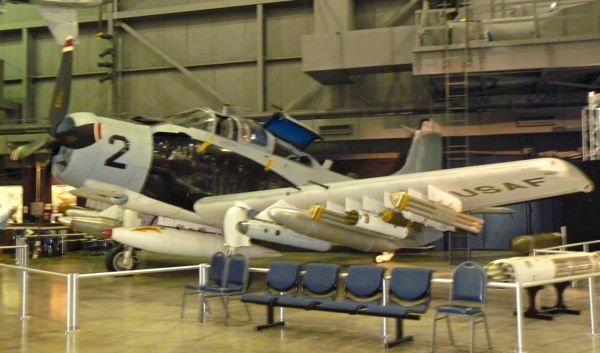 The A-1 Skyraider attack craft, nicknamed Spad, was used in Vietnam for ground support of troops and to attack enemy positions and supply lines. It was also used extensively during the Korean War. One of the last propeller driven aircraft used in combat by the USA, and considered one of the best. 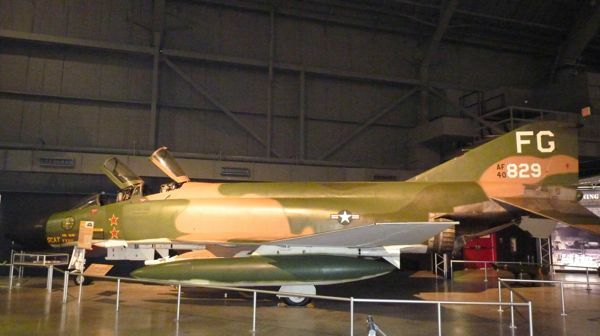 The F-4 Phantom II jet fighter-interceptor was the one that lit my fire when I served as a medic in the Air Force during Nam. It was the principal fighter there, and also served in the Gulf War. The last US fighter flown to attain ace status by a combat pilot. And was also used by both the USAF Thunderbirds and USN Blue Angels demo teams. 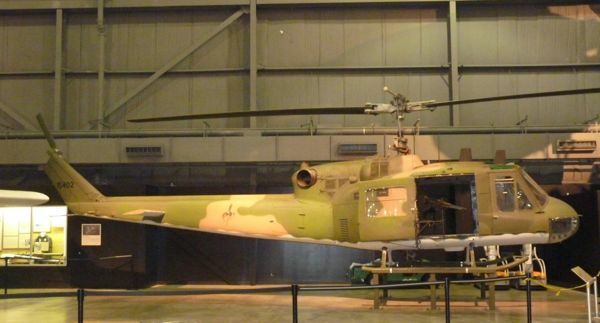 The HU-1 Iroquois helicopter was commonly called the Huey and was the one most often used to insert and remove troops in the field during the Vietnam conflict. It was essential for med-evac which also used a larger chopper nicknamed the Jolly Green Giant. 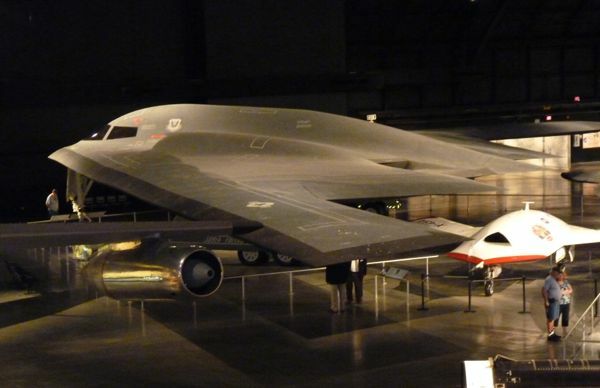 The B-2 Spirit bomber, often called the Stealth, was the one used in Iraq during Operation Desert Storm of the Gulf War. A fellow worker served in the Army Rangers during that conflict. The small white craft was the X-45 experimental unmanned fighter. 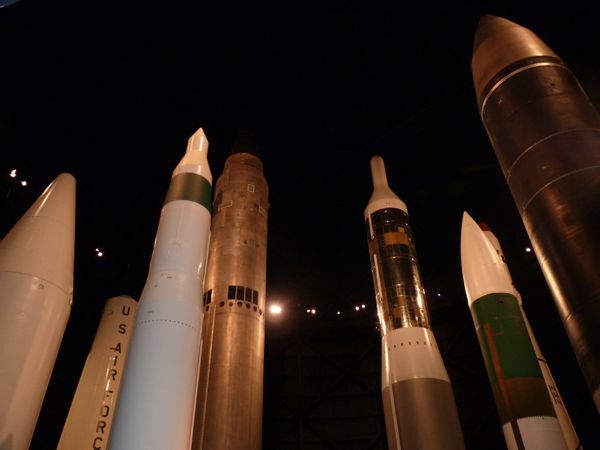 An array of missiles that protected us during the Cold War Era. The photo was taken from about half way up. They were very tall. My nephew served as a silo captain in North Dakota, so I appreciated seeing them and the control room display. 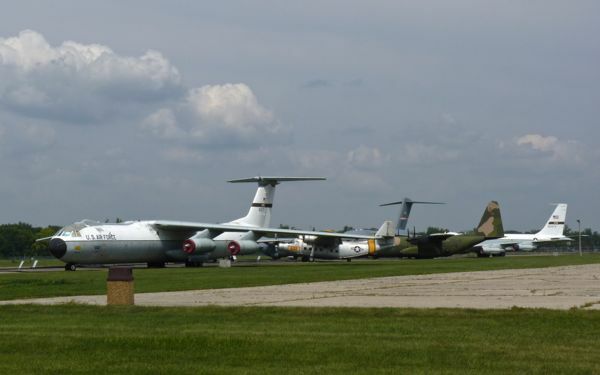 The flight line outside the museum displayed transport aircraft. On my way out, I strolled through the Memorial Park which had monuments honoring airmen and units that have served to protect our freedoms. It stirred feelings of respect and admiration, and brought back memories of my time in the service. I’m glad I went to see it.